Definition at line 72 of file llfloatercustomize.h. Definition at line 75 of file llfloatercustomize.h. Definition at line 76 of file llfloatercustomize.h. Definition at line 1550 of file llfloatercustomize.cpp. References LLInventoryModel::addObserver(), LLUICtrlFactory::buildFloater(), createWearablePanel(), gAgent, LLAgent::getAvatarObject(), LLCharacter::getSex(), gInventory, gSavedSettings, gUICtrlFactory, mInventoryObserver, mResetParams, LLControlGroup::setU32(), SEX_MALE, WT_EYES, WT_GLOVES, WT_HAIR, WT_JACKET, WT_PANTS, WT_SHAPE, WT_SHIRT, WT_SHOES, WT_SKIN, WT_SKIRT, WT_SOCKS, WT_UNDERPANTS, and WT_UNDERSHIRT. Definition at line 2105 of file llfloatercustomize.cpp. 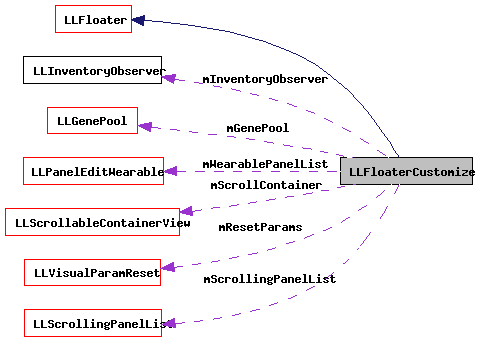 References gInventory, llendl, llinfos, mGenePool, mInventoryObserver, mResetParams, and LLInventoryModel::removeObserver(). Definition at line 2258 of file llfloatercustomize.cpp. References LLViewerWindow::alertXml(), gViewerWindow, isDirty(), mNextStepAfterSaveAllCallback, mNextStepAfterSaveAllUserdata, onSaveAllDialog(), and TRUE. Referenced by handle_reset_view(), remove_inventory_category_from_avatar(), LLAgent::userRemoveAllClothes(), and wear_inventory_category_on_avatar(). Definition at line 2211 of file llfloatercustomize.cpp. Definition at line 1728 of file llfloatercustomize.cpp. References edit_wearable_for_teens(), gAgent, LLAgent::isTeen(), WearablePanelData::mFloater, WearablePanelData::mType, mWearablePanelList, NULL, and type. Definition at line 2134 of file llfloatercustomize.cpp. References LLPanel::childSetEnabled(), LLFloater::draw(), LLView::getVisible(), isDirty(), LLFloater::isMinimized(), and updateInventoryUI(). Definition at line 2327 of file llfloatercustomize.cpp. References LLInventoryFetchObserver::fetchItems(), gAgent, LLAgent::getWearableItem(), LLUUID::notNull(), S32, type, WT_COUNT, and WT_SHAPE. Definition at line 2219 of file llfloatercustomize.cpp. References LLScrollingPanelList::addPanel(), LLScrollingPanelList::clearPanels(), end, and mScrollingPanelList. Definition at line 99 of file llfloatercustomize.h. Referenced by getEditGroup(), LLPanelEditWearable::onBtnSubpart(), LLScrollingPanelParam::onSliderMouseDown(), and switchToDefaultSubpart(). Definition at line 110 of file llfloatercustomize.h. Definition at line 1530 of file llfloatercustomize.cpp. References LLPanelEditWearable::getCurrentSubpart(), getCurrentWearablePanel(), and LLSubpart::mEditGroup. Definition at line 2197 of file llfloatercustomize.cpp. References LLView::addChild(), LLUICtrlFactory::getScrollableContainerByName(), mScrollingPanelList, and LLScrollableContainerView::setScrolledView(). Definition at line 1746 of file llfloatercustomize.cpp. References LLPanelEditWearable::addColorSwatch(), LLPanelEditWearable::addSubpart(), LLPanelEditWearable::addTextureDropTarget(), LLPanel::childSetAction(), LLPanel::childSetCommitCallback(), f, FALSE, LLControlGroup::getString(), gSavedSettings, LLSubpart::mCameraOffset, LLSubpart::mEditGroup, LLSubpart::mSex, LLSubpart::mTargetJoint, LLSubpart::mTargetOffset, mWearablePanelList, LLUUID::null, LLPanelEditWearable::onBtnRandomize(), LLPanelEditWearable::onCommitSexChange(), LLVector3d::setVec(), SEX_MALE, SUBPART_EYES, SUBPART_GLOVES, SUBPART_HAIR_COLOR, SUBPART_HAIR_EYEBROWS, SUBPART_HAIR_FACIAL, SUBPART_HAIR_STYLE, SUBPART_JACKET, SUBPART_PANTS, SUBPART_SHAPE_CHIN, SUBPART_SHAPE_EARS, SUBPART_SHAPE_EYES, SUBPART_SHAPE_HEAD, SUBPART_SHAPE_LEGS, SUBPART_SHAPE_MOUTH, SUBPART_SHAPE_NOSE, SUBPART_SHAPE_TORSO, SUBPART_SHAPE_WHOLE, SUBPART_SHIRT, SUBPART_SHOES, SUBPART_SKIN_BODYDETAIL, SUBPART_SKIN_COLOR, SUBPART_SKIN_FACEDETAIL, SUBPART_SKIN_MAKEUP, SUBPART_SOCKS, SUBPART_UNDERPANTS, SUBPART_UNDERSHIRT, LLVOAvatar::TEX_EYES_IRIS, LLVOAvatar::TEX_HAIR, LLVOAvatar::TEX_HEAD_BODYPAINT, LLVOAvatar::TEX_LOWER_BODYPAINT, LLVOAvatar::TEX_LOWER_JACKET, LLVOAvatar::TEX_LOWER_PANTS, LLVOAvatar::TEX_LOWER_SHOES, LLVOAvatar::TEX_LOWER_SOCKS, LLVOAvatar::TEX_LOWER_UNDERPANTS, LLVOAvatar::TEX_SKIRT, LLVOAvatar::TEX_UPPER_BODYPAINT, LLVOAvatar::TEX_UPPER_GLOVES, LLVOAvatar::TEX_UPPER_JACKET, LLVOAvatar::TEX_UPPER_SHIRT, LLVOAvatar::TEX_UPPER_UNDERSHIRT, TRUE, WT_EYES, WT_GLOVES, WT_HAIR, WT_JACKET, WT_PANTS, WT_SHAPE, WT_SHIRT, WT_SHOES, WT_SKIN, WT_SKIRT, WT_SOCKS, WT_UNDERPANTS, and WT_UNDERSHIRT. Definition at line 2158 of file llfloatercustomize.cpp. References FALSE, i, mWearablePanelList, S32, TRUE, and WT_COUNT. Referenced by askToSaveAllIfDirty(), and draw(). Definition at line 1684 of file llfloatercustomize.cpp. References edit_wearable_for_teens(), FALSE, gAgent, LLAgent::getAvatarObject(), LLAgent::getWearable(), i, LLAgent::isTeen(), NULL, onMakeOutfitCommit(), S32, LLMakeOutfitDialog::setWearableToInclude(), LLModalDialog::startModal(), WT_COUNT, and WT_SHIRT. Definition at line 1652 of file llfloatercustomize.cpp. Definition at line 1659 of file llfloatercustomize.cpp. References f, FALSE, LLControlGroup::getString(), LLViewerWindow::getWindowHeight(), LLViewerWindow::getWindowWidth(), gSavedSettings, gViewerWindow, LLViewerWindow::rawSnapshot(), send_sound_trigger(), and TRUE. Definition at line 2179 of file llfloatercustomize.cpp. References gFloaterView, handle_reset_view(), and LLView::sendChildToBack(). Definition at line 1711 of file llfloatercustomize.cpp. References gAgent, LLAgent::getAvatarObject(), LLMakeOutfitDialog::getFolderName(), LLMakeOutfitDialog::getIncludedItems(), LLMakeOutfitDialog::getRenameClothing(), and LLAgent::makeNewOutfit(). Definition at line 2281 of file llfloatercustomize.cpp. References FALSE, gAgent, getCurrentWearableType(), llassert, LLAgent::revertAllWearables(), LLAgent::saveAllWearables(), setCurrentWearableType(), and TRUE. Definition at line 2173 of file llfloatercustomize.cpp. Definition at line 1585 of file llfloatercustomize.cpp. References LLPanel::childSetAction(), LLPanel::childSetTabChangeCallback(), LLPanel::childShowTab(), gAgent, LLUICtrlFactory::getTabContainerByName(), initScrollingPanelList(), initWearablePanels(), LLAgent::isTeen(), onBtnMakeOutfit(), onBtnSaveAll(), LLFloater::onClickClose(), onTabChanged(), TRUE, WT_EYES, WT_GLOVES, WT_HAIR, WT_JACKET, WT_PANTS, WT_SHAPE, WT_SHIRT, WT_SHOES, WT_SKIN, WT_SKIRT, WT_SOCKS, WT_UNDERPANTS, and WT_UNDERSHIRT. Definition at line 1634 of file llfloatercustomize.cpp. References LLPanel::childShowTab(), LLView::getName(), gFloaterCustomize, mWearablePanelList, S32, and switchToDefaultSubpart(). Referenced by LLWearableBridge::editOnAvatar(), onSaveAllDialog(), onTabChanged(), LLAgent::setWearableOutfit(), and LLWearable::writeToAvatar(). Definition at line 2235 of file llfloatercustomize.cpp. References FALSE, gAgent, LLAgent::getAvatarObject(), LLCharacter::getSex(), gSavedSettings, llassert, mWearablePanelList, PERM_MODIFY, LLControlGroup::setU32(), LLPanelEditWearable::setWearable(), SEX_MALE, updateScrollingPanelList(), and WT_COUNT. Referenced by LLWearable::removeFromAvatar(), and LLWearable::writeToAvatar(). Definition at line 2119 of file llfloatercustomize.cpp. References gAgent, LLAgent::getAvatarObject(), mGenePool, and LLGenePool::spawn(). Definition at line 2114 of file llfloatercustomize.cpp. Referenced by setCurrentWearableType(), and LLMorphView::setVisible(). Definition at line 2347 of file llfloatercustomize.cpp. References LLPanel::childSetEnabled(), LLPanel::childSetVisible(), FALSE, gAgent, LLPermissions::getMaskOwner(), LLInventoryItem::getPermissions(), LLPanelEditWearable::getType(), LLAgent::getWearableInventoryItem(), i, LLViewerInventoryItem::isComplete(), mWearablePanelList, NULL, PERM_MODIFY, S32, sCurrentWearableType, TRUE, and WT_COUNT. Definition at line 2248 of file llfloatercustomize.cpp. Referenced by LLUndoWearable::applyUndoRedo(), LLPanelEditWearable::onBtnRandomize(), setWearable(), and updateScrollingPanelUI(). Definition at line 2389 of file llfloatercustomize.cpp. References FALSE, gAgent, LLPermissions::getMaskOwner(), LLInventoryItem::getPermissions(), LLPanelEditWearable::getType(), LLAgent::getWearableInventoryItem(), LLViewerInventoryItem::isComplete(), mWearablePanelList, PERM_MODIFY, sCurrentWearableType, and updateScrollingPanelList(). Referenced by LLFloaterCustomizeObserver::changed(), and LLPanelEditWearable::setSubpart(). Definition at line 132 of file llfloatercustomize.h. Referenced by spawnWearableAppearance(), and ~LLFloaterCustomize(). Definition at line 135 of file llfloatercustomize.h. Referenced by LLFloaterCustomize(), and ~LLFloaterCustomize(). Definition at line 138 of file llfloatercustomize.h. Definition at line 133 of file llfloatercustomize.h. Definition at line 131 of file llfloatercustomize.h. Definition at line 130 of file llfloatercustomize.h. Referenced by clearScrollingPanelList(), generateVisualParamHints(), initScrollingPanelList(), and updateScrollingPanelList(). Definition at line 126 of file llfloatercustomize.h. Referenced by createWearablePanel(), getCurrentWearablePanel(), initWearablePanels(), isDirty(), setCurrentWearableType(), setWearable(), updateInventoryUI(), and updateScrollingPanelUI(). Definition at line 128 of file llfloatercustomize.h. Referenced by getCurrentWearablePanel(), getCurrentWearableType(), updateInventoryUI(), and updateScrollingPanelUI().